NYC, 05/23/2019, 2:00PM. 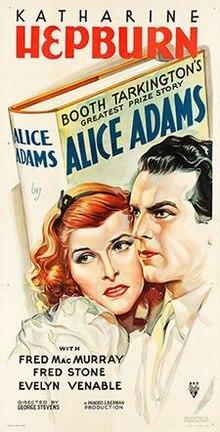 Oscar Nominated Alice Adams (1935): Comedy Drama Based On A Novel. A young girl hoping to marry well in the 20s soon finds out some of the realities of love and life. 99 min. Director: George Stevens. Starring Katharine Hepburn, Fred MacMurray, Fred Stone. The film was adapted from the novel Alice Adams by Booth Tarkington. The film received two Academy Award nominations for Best Picture and Best Actress.